"I feel like I need to wake up." 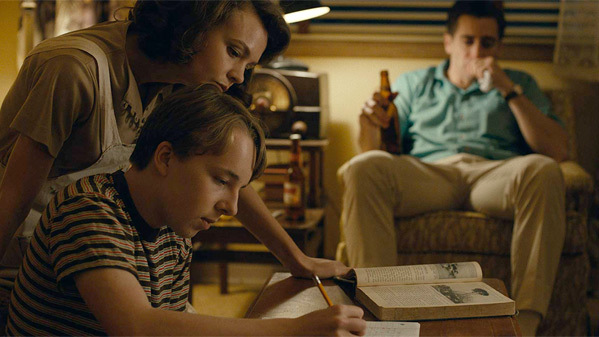 IFC Films has debuted a new 60-second trailer for Wildlife, the directorial debut of actor Paul Dano. This highly regarded film premiered at the Sundance Film Festival earlier this year, played at the Cannes Film Festival, and is now showing at the New York Film Festival after stopping by TIFF - you can see the full trailer here. And it's still getting rave reviews each time it plays at a fest. Wildlife tells the story of a young husband and wife living in the 1960s in a small town in Montana, adapted from Richard Ford's novel of the same name. Carey Mulligan and Jake Gyllenhaal star, and Ed Oxenbould plays their teenage son. It's a subtle film about family and the breakdown of a family by following Mulligan as the housewife who realizes she needs to be free. The cast includes Bill Camp & Zoe Margaret Colletti. The film arrives in limited theaters at the end of this month for those who have been waiting to finally see it. You can still watch the teaser trailer for Paul Dano's Wildlife here, or the full-length official trailer here. Elegantly adapted from Richard Ford's novel of the same name, Carey Mulligan delivers one of her finest performances to date as Jeanette Brinson, a complex woman whose self-determination and self-involvement disrupts the values and expectations of a 1960s nuclear family. Fourteen-year-old Joe played by newcomer Ed Oxenbould, is the only child of Jeanette (Mulligan) and Jerry (Jake Gyllenhaal)—a housewife and a golf pro—in a small town in 1960s Montana. Nearby, an uncontrolled forest fire rages close to the Canadian border, and when Jerry loses his job—and his sense of purpose—he decides to join the cause of fighting the fire, leaving his wife and son to fend for themselves. Suddenly forced into the role of an adult, Joe witnesses his mother's struggle as she tries to keep her head above water. Wildlife is directed by acclaimed actor-turned-filmmaker Paul Dano, making his major feature directorial debut after executive producing a few other films. The screenplay is written by Zoe Kazan and Paul Dano, adapted from Richard Ford’s novel. This first premiered at the Sundance Film Festival earlier this year. IFC will release Paul Dano's Wildlife in select theaters starting October 19th this fall. How does that look? Still interested?